As U.S. President Donald Trump prepares to travel to China in early November he should include in his daily tweets the hashtags of #FreeReligiousPrisoners and #ReligiousFreedom. Out of nearly 1.4 billion citizens of China, untold numbers are victims of the Chinese government’s relentless drive for control over religious beliefs, activities, and advocacy. In mid-October, China’s 19th Party Congress met and confirmed President Xi Jinping’s dominance and increased control over all aspects of Chinese life. As expected as it was, this bodes very badly for the millions in China seeking greater freedom of religion or belief. As part of its brutal campaign, China seeks to erase the Tibetan and Uyghur cultures and their respective religions through “sinicization” — the government’s bid to conform religion to its own image. Seeking stability and control, its repressive actions have caused suffering and despair among Tibetan Buddhists and Uyghur Muslims, as well as other religious and ethnic communities. We want to highlight two of China’s many religious prisoners. One is a Tibetan Buddhist destined to be his people’s leader. The other is a 39-year-old Uyghur Muslim, community leader, website administrator, and government worker. Both are prisoners of conscience, unfairly treated by the Chinese government, and on whose behalf we are working as part of the Religious Prisoners of Conscience Project of the U.S. Commission on International Religious Freedom (USCIRF), on which we serve. The Tibetan Buddhist is Gedhun Choekyi Nyima, whom His Holiness the Dalai Lama chose as the 11th Panchen Lama, the second highest position in Tibetan Buddhism. Three days after his selection in 1995, Chinese government authorities kidnapped the then six-year old and his family from their home in Tibet. The government has kept him “disappeared” for more than two decades, making him one of the world’s longest-held prisoners of conscience. 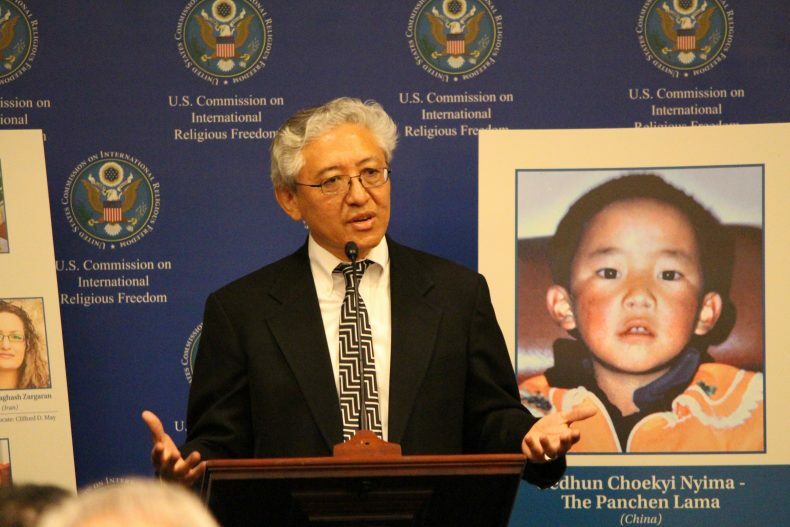 USCIRF Commissioner Tenzin Dorjee, the first Tibetan Buddhist appointed to the Commission, calls on China to release the Panchen Lama at a rollout of USCIRF’s Religious Prisoners of Conscience Project (Photo Credit: USICRF). The Uyghur Muslim is Gulmira Imin, who was born and raised in the Xinjiang Uyghur Autonomous Region of northwest China. Imin was the moderator of Salkin, a now defunct Uyghur-language culture and news website, to which she contributed poetry and short stories that included criticism of Chinese government policies. In July 2009, authorities accused her of organizing protests which, initially peaceful, turned violent. On April 1, 2010, the Urumqi Intermediate People’s Court sentenced her to life in prison on charges of “splittism, leaking state secrets, and organizing an illegal demonstration.” Gulmira says that she was tortured, forced to sign documents she had not read, and denied access to a lawyer until her trial. Gulmira’s only “crime” was her leadership in the Uyghur community and participation in the protests. 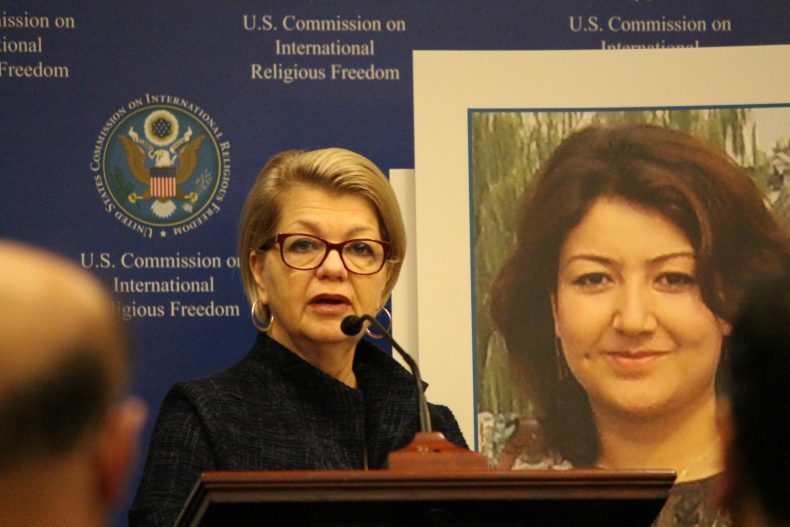 USCIRF Vice Chairwoman Sandra Jolley, speaks out on behalf of Gulmira Imin at a rollout of USCIRF’s Religious Prisoners of Conscience Project (Photo Credit: USICRF). In both the Tibetan Autonomous Region (and Tibetan areas of other provinces) and Xinjiang, the government dramatically has increased the security apparatus through extensive surveillance and placed government officials in houses of worship and private homes to verify that no “illegal” religious activity occurs. Authorities monitor phones and computers, install closed-circuit television, restrict travel within and outside of the regions, cancel previously permitted festivals, and have imprisoned thousands. Seeking to reduce the influence of religion in both areas, the government has used the excuse of public safety to destroy thousands of mosques in Xinjiang and religious buildings in Tibet and Tibetan areas of China, including the Larung Gar Buddhist Institute. The Chinese government also has targeted children, believing that they will be easier to “sinicize” if they are ignorant of their religion and culture. Authorities in Tibet prohibit children from learning the Tibetan language and participating in religious holidays, threatening them with expulsion from school if they fail to comply. Similarly, as of November 1, 2016, Uyghur Muslim parents are forbidden from including their children in any religious activity. These and other measures exemplify the actions Party Secretary Chen Quanguo has taken to ensure the government’s control over religious and ethnic minorities. From 2011-2016, Chen led efforts in Tibet to install a sophisticated surveillance network and undertook other repressive measures. He has been replicating these actions in Xinjiang since his reassignment there in August 2016. Because of these and other abuses, USCIRF has recommended since 1999 that the State Department designate China as a “country of particular concern” (CPC) for its systematic, ongoing, and egregious violations of religious freedom. The State Department has designated China as a CPC since 1999, most recently in October 2016. USCIRF encourages the State Department to again designate China when it makes this year’s designations, which are due in mid-November. USCIRF also urges the swift enactment of H.R. 1872, the Reciprocal Access to Tibet Act, which would send an important signal to China about the need for mutual access and reciprocity. We also urge the administration to deny visas to, and freeze assets of, Chinese officials subject to provisions in the Global Magnitsky Human Rights Accountability Act and the Frank R. Wolf International Religious Freedom Act. With President Trump going to China, we must not forget the persecution and struggles of Tibetan Buddhists, Uyghur Muslims, and the many other members of religious and ethnic minority communities. The Chinese government must uphold, not repress, their rich religious and cultural traditions and free the many prisoners of conscience, including the Panchen Lama and Gulmira Imin. Sandra Jolley is Vice Chairwoman and Commissioner and Tenzin Dorjee is Commissioner on the U.S. Commission on International Religious Freedom, an independent, bipartisan federal commission created by Congress to monitor and review violations of religious freedom abroad and make policy recommendations to the President, the Secretary of State, and the Congress. They have adopted the prisoners in the Op-Ed as part of USCIRF’s Religious Prisoners of Conscience project and have been advocating for their freedom.